Blockchain technology: a fad or here to stay? Last week, I gave you a high-level overview of Blockchain technology and questions to ask yourself when considering this approach for your investment bank. Now, let’s look at why Blockchain technology might just be the answer to simplifying and enhancing functions in your bank. Banks and venture capitalists have begun investing in Blockchain technology. What secret are they in on? The banks’ view is that counterparty risk could be minimized, settlement times reduced, contractual term performance improved and transparency for regulatory reporting increased. Enter Blockchain technology. A number of companies are subsequently investing in the space, both directly and by taking stakes in existing start-ups. It’s clear to us: Blockchain technology has the potential to become the critical backbone of the future capital markets infrastructure. Blockchain technology could initially have an impact on asset classes which are complicated and not centrally cleared, such as certain types of derivatives, given the unique ability to easily track and maintain complex trade records and blotters. In the longer term, as regulations catch up with the technology, the settlement of currency, equity and fixed income trades almost instantaneously through permissioned distributed ledgers creates a significant opportunity for banks to drive efficiency and potentially create new asset classes. The other near-term effect of Blockchain technology adoption for distribute ledgers will likely be the adoption of smart contracts as counterparties agree on contractual terms through computer protocols. Leveraging Blockchain technology within the capital markets industry will be significant if the existing legacy technology, operations and infrastructure landscape within the established capital markets players is considered. The number of applications within and outside the banks could be reduced as the Blockchain transaction contains all relevant information for the successful transfer of assets and/or related contracts. Bottom line: the maturing Blockchain landscape has the opportunity to be a tremendous source of innovation which requires further due diligence for defining industry standards with regards to settlement, counterparty and other transactional risks involved. An agile approach allowing regulatory evolution in parallel to the maturing innovation offering will be key to maintaining that balance between security and future mass market Blockchain scalability. 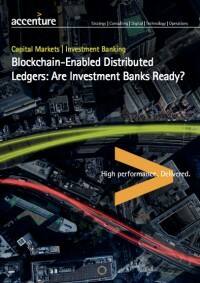 Newer paper is attached or at: Blockchain-Enabled Distributed Ledgers: Are Investment Banks Ready? Next Post - Blockchain technology has significant potential to disrupt—what questions do you need to ask yourself now? Suggested Post - Blockchain technology has significant potential to disrupt—what questions do you need to ask yourself now?